Slider or not, you decide! 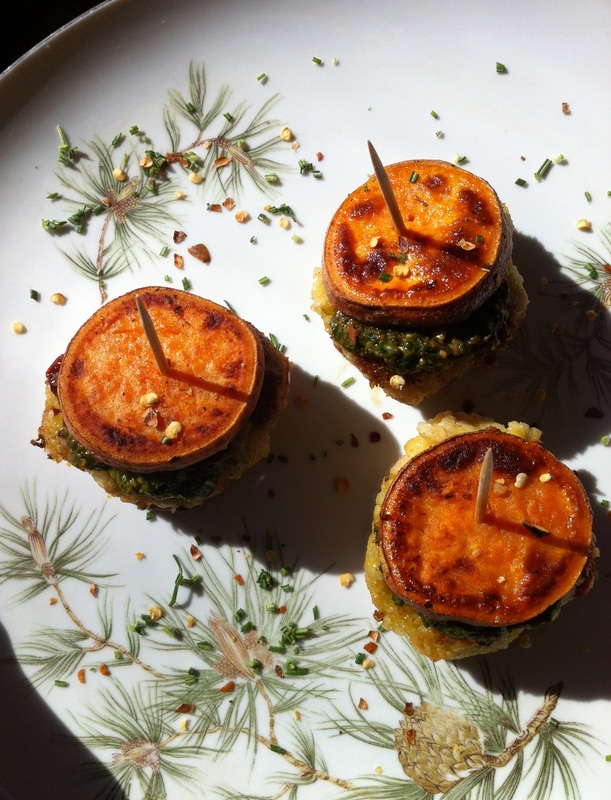 These little vegan bites are a pleasing blend of some of my favorite ingredients. Studded with bits of artichoke, tangy sundried tomatoes (from the garden! ), bright herbs…and mellow garbanzo beans, fragrant basmati rice. sundried tomatoes for little bursts of flavor! 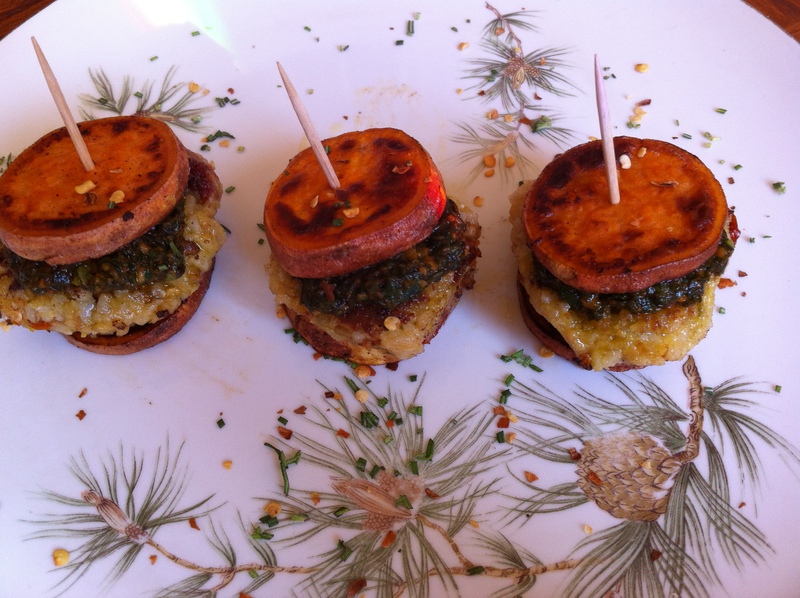 The fun part is the “bun” – roasted slices of sweet potatoes, a fantastic (gluten free!) idea from Make it Naked. This experimental batch today is a first run for a get-together this weekend, and I’m hankering to try the next round with a little dairy: maybe some crumbled goat cheese from Avalanche Cheese Company whose dairy and farm are right here in Paonia. Or a sharp Romano? With a smear of lemony basil pesto on top, this vegan version is mighty good. So easy. And just a little messy to eat. with little rainbows from the window crystal hitting the sliders, they’re truly in the limelight! Note: If you like to add some type of binder for the sliders other than the natural qualities of the rice/garbanzo mixture, add an egg, or, 1 tbsp. ground flax seed mixed in 2 tbsp. warm water. I kept it simple today. Preheat oven to 400 degrees. Scrub potatoes well, then slice (without peeling) into approximately 1/4 inch rounds. Lay them out singly on a lightly oiled baking sheet, and roast in a hot oven about 25 minutes, while preparing the sliders. Turn the potatoes halfway through roasting, for crispness on both sides, check for tenderness, and pull from oven. Pat dry with a paper towel if you like. While potatoes are in the oven, blend all the rest of the ingredients in a food processor or blender with a series of pulses, taking care to not turn the mix into a puree, and shape into tiny patties, approximately 18-20 or so from a single batch. In a skillet over medium heat, sauté the sliders in a little butter or oil about 5 – 6 minutes, flip and finish in about 5 minutes more, until golden brown on both sides. 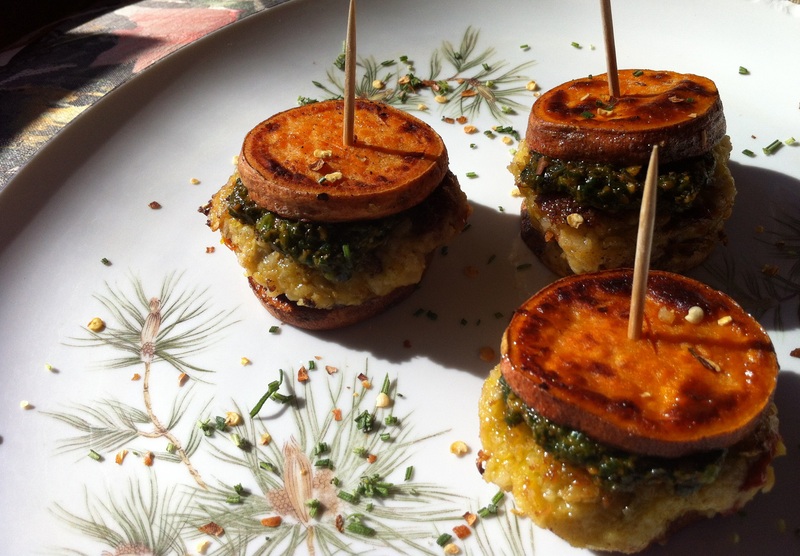 Warm your pesto, and smear 1 tbsp. atop the each slider before tucking them inside the roast potatoes. Serve hot – room temperature. Here’s one more close up of the lovely sliders. ….wouldn’t it be fun to be cooking a meal together?